The Rap Battle Against Police Brutality will take place on Feb 15th 2017, at the Belmont (a well­known venue for local hip hop). 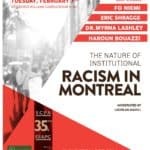 Local Montreal hip hop artists, especially people of colour, will be demanding an end to state ­sanctioned police violence­­ and to honour black lives and indigenous sisters who were taken away by police brutality. On the other side, the supporters of law and order such as politicians, journalists, and cops will be rallying to support the continued state repression against marginalized peoples.